La Posada is located just south of Kellogg on Oliver. It’s on the east side of the street, in a strip mall. We were eating dinner midweek, so we weren’t surprised that the small restaurant wasn’t very busy. The waitress was really friendly, and the restaurant was clean. She immediately brought us two small metal pitchers of salsa. I claim to like spicy, but my sister LOVES spicy. So we debated whether the red or green salsa was more spicy, then finally dumped each into separate bowls and tried it out. The green salsa was much spicier. We each made our own concoction of the two salsas and got to work getting our money’s worth. Delicous! A visit to a Mexican restaurant isn’t complete without queso dip, and I was sad to not see it listed on the menu under appetizers. But I figured it was worth an ask. To my glee, the waitress confirmed she could bring me some! Yippee! It wasn’t the best cheese dip I’d ever had, but considering it wasn’t listed on the menu, I was happy to have anything. With queso and salsa-filled chips firmly in-hand we decided to tackle the menu to decide what we wanted. Karla admitted she was eying the fried flour tacos, since that’s what she always gets the first time at a new Mexican restaurant. I, on the other hand, was feeling adventurous, and wanted something with several items. 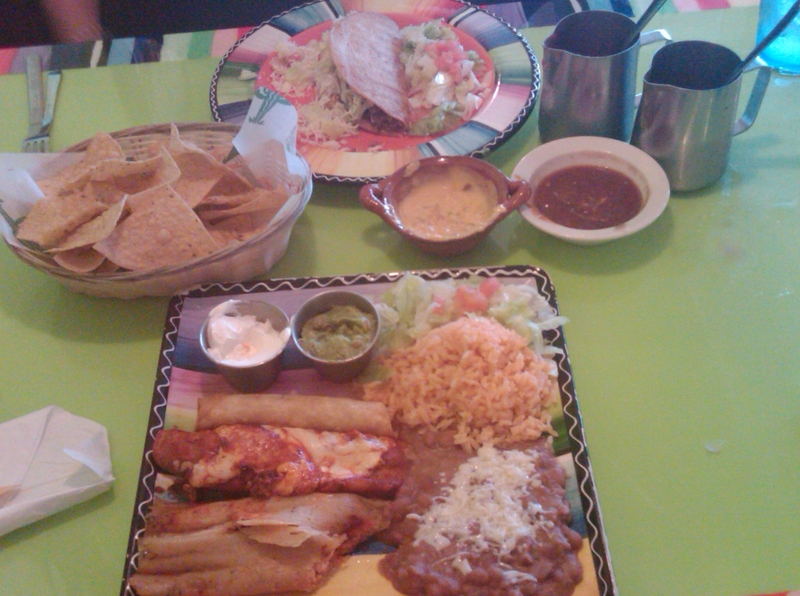 I finally settled on a combination plate that included a tamale, cheese enchilada (which is what I like to get when I’m confused at a Mexican restaurant), and a taquito, with a side of rice and beans. Yes, I am THAT girl who ordered that much food. And damn, I was excited to devour it! Karla settled on filling her fried flour taco with beef. We continued to impale the chips, salsa and queso at a professional’s pace until our food arrived. The food wasn’t the most fantastic Mexican food I’ve ever had, but it wasn’t bad, either. I think it was made well. I’m pretty sure I just picked the wrong items for my taste. Karla’s taco was really good, so two thumbs up on that sucker. I went home stuffed. And swore off Mexican food. As I always do when I eat Mexican food…. Bottom line: I’d go back but next time I’ll be more selective in what I choose (rather than trying to get one of everything). I probably won’t order the cheese dip again because it wasn’t fantastic. But I definitely dug the salsa. Um, YUM! This looks REALLY good! Rocky and I LOVE the taquitos at the small Mexican restaurant here in Shen., plus I think they have some of the best salsa around. The queso is also pretty darn tasty and cheap! Not to mention $2 margaritas on Wednesdays!! Hmmm, this may just be a ploy to get you up here to visit! =) Either way, from the looks of the table I really think I would definitely eat at this place and probably love it! I’m not entirely sure why I got the sampler. I’ve always thought tamales were kind of dry (these were good, but as usual I thought dry)… And I’d much rather have a taco than a taquito. And while I like red enchilada sauce, we all know my heart’s with a cheese sauce.